Eating gluten-free and ordering takeout aren’t always the easiest of things to accomplish simultaneously. It’s becoming more convenient in our neighborhood, with a couple restaurants making significant efforts to cater to their GF customers, but sometimes one is simply not in the mood for Latin fusion or a burger and fries. Sometimes a person just wants to open the door and be presented with a smiley-face bag full of sodium-laden Chinese chow. Unfortunately, Chinese is one of the most difficult of all takeout options. It seems as though it should be rather innocuous. Beef and broccoli and rice. Chicken and snow peas and rice. All obviously gluten-free—if you’re ordering them steamed, that is. Otherwise, nearly all Chinese sauces have some sort of wheat component. 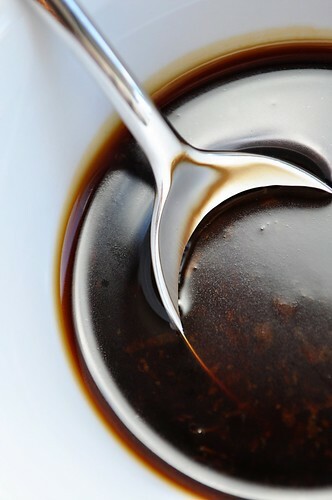 It’s been two years, but the fact that soy sauce contains wheat still makes me twitch with annoyance. So, any time we’ve ordered Chinese over the past couple years, I’ve gotten plain old steamed something. My saucy solution has been to drown it in wheat-free tamari. Not bad, but it’s not always fulfilling when Chris is sitting next to me with his sesame chicken and eggplant with garlic sauce. For the past few weeks, though, I’ve been on a pseudo-Asian lunch kick. I’ll cook up some quinoa and stir fry some tempeh and mushrooms and whatever else I have on hand, finishing it in my own concoction of a sauce. It’s been great and I’ve slowly figured out a recipe that I love. So, when we decided to order Chinese a few nights ago and tamari-soaked, steamed snow peas weren’t sounding awesome, I decided to cook up a stand-alone batch of this Sweet and Spicy Sauce. This isn’t exactly how I’d make it if I were making a stir fry, but it is perfect for spooning over steamed chicken and veggies and rice. I’d imagine it would be great for dipping gluten-free dumplings or spring rolls as well. 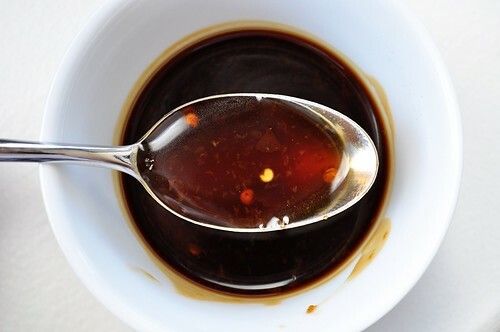 And if you’re not gluten-free, this can still be a great addition to your homemade Chinese repertoire—or give you a bit of control over what exactly is saucing up your takeout. Sub in regular soy sauce if you don’t feel like buying tamari (of course, this is only if you’re not gluten-free!) and play with it. Make it your own. Bottom line: Chinese delivery doesn’t have to be boring for the gluten-free anymore. The next time you’re waiting for your bland, steamed entrée to arrive, throw this together. The ingredients are all simple pantry staples, and it seriously cooks up in about five minutes. Your apartment will be smelling like tasty Chinese food long before you hear the knock on your door. In a small bowl, whisk the potato starch into the tamari. Add the rice wine vinegar and agave, and whisk to combine. Heat the sesame oil in a small saucepan over medium heat. Grate in the clove of garlic (or mince finely and add) and cook until fragrant, about 1 minute. Add the crushed red pepper and sauté for about 30 seconds to release the heat. Pour the tamari mixture into the saucepan and stir. Cook until it begins to bubble and thickens slightly. Pour into a bowl and use as desired. Sauce will continue to thicken as it cools. Note: If you are partial to ginger, feel free to either whisk 1/4 teaspoon of ground ginger into the tamari/vinegar/agave mixture or add roughly 1/2 teaspoon of minced or grated ginger to the oil along with the garlic. Just found your blog! I love it! And I love that you posted all of those GF restaurants in NYC. Being recently diagnosed, I'm nervous to go out to eat, but not with these restaurants!